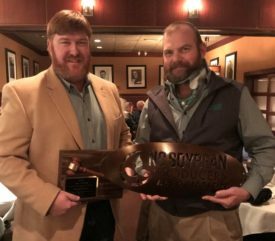 Two North Carolina Soybean Association board members were recognized at the NC Commodities Conference on Jan. 9, 2019 for meritorious service to the soybean farmers of North Carolina. John Fleming, of Halifax County, received the President’s Award, and Boerema, of Hyde County, received the Dr. Jim Dunphy Soybean Industry Award. Fleming (pictured at left receiving the award from incoming president Jeff Tyson) was given the President’s award for outstanding leadership and service while serving as president of the North Carolina Soybean Producers Association from Jan. 2017 through Jan. 2019. 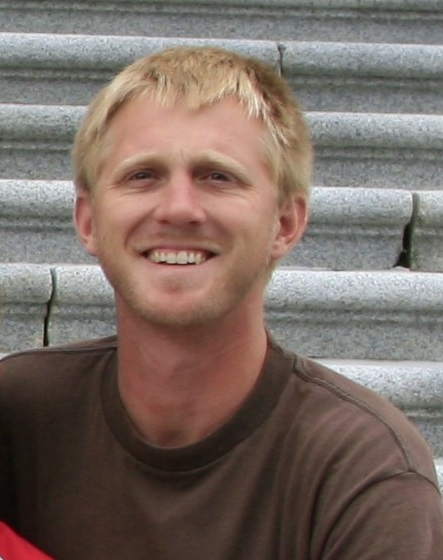 Fleming was vice president of the association from 2015 to 2017. During Fleming’s term as president, he oversaw an expansion of the research program to ensure results of the research projects in which the association invests provide the best return for soybean farmers in the state. He was also actively involved in the association’s advocacy efforts and worked tirelessly to ensure the interests of North Carolina soybean farmers were represented on Capitol Hill. Boerema (right) received the Dunphy Soybean Industry Award in recognition of his volunteer service for his leadership of the North Carolina Soybean Producers Association’s research committee. Boerema identified projects that provide the best return for soybean farmers in the state and innovated the association’s approach to selecting projects in which to invest. The NCSPA thanks these two farmers for their longstanding service!